July 12, 2018, 3:11 p.m. 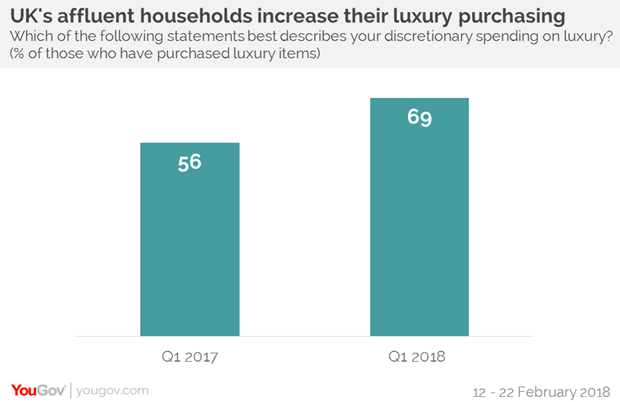 Affluent households in the UK have increased their purchasing of luxury items at the same time as their economic confidence falls, new data from YouGov’s Affluent Perspective study reveals. The data, based on the views and behaviours of people in households earning £100,000 or more a year, shows that there has been a 13 percentage point jump in those buying luxury items – growing from 56% in 2017 to 69% this year. This increase outpaces many other countries in the study. However, YouGov’s research suggests that as luxury purchasing has increased in the UK, pessimism about the economy has increased. Just 13% of affluent households in the United Kingdom are confident in the global economy, a decline of three percentage points on 2017. There has been a parallel fall in affluent households’ confidence in the UK economy. The data points to a number of factors that contribute to this shaky confidence. As well as concerns in affluent households about the future of their children, education, healthcare, growing income disparity, and the security of their personal information, one fear factor that has particularly increased in the past year is the security of their retirement assets. Currently, 26% of the UK’s wealthiest households are concerned about this – an increase from 22% a year ago. It also seems that UK affluent households’ increased uncertainty extends to their personal economy, setting them apart from wealthy consumers in other countries. In the UK, confidence in their personal balance sheets has fallen from 44% in 2017 to 31% this year. 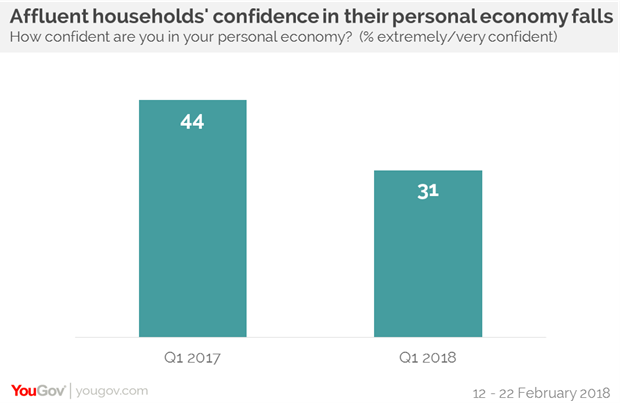 However, in China, the opposite is true, with affluent households’ confidence in their personal economy has risen from 57% to 64%. One reason why affluent households have increased their purchasing on luxury items just as their economic confidence falls is that many find it difficult to stop. 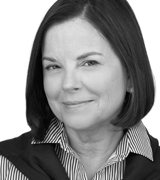 Despite a disciplined approach to discretionary spending, four in ten (39%) affluent households in the UK believe that “once you experience luxury, it’s hard to scale back.” Perhaps this is because almost half (46%) think that luxury is worth the cost, and a necessary purchase in a life full of concern and uncertainty. The global expansion in the number of wealthy households and the assets they hold is a phenomenon that continues to reward luxury brands. However, while affluent households in much of the rest of the world are confident, those in the UK are much more uncertain. But whether they see the glass half-full or half-empty, luxury continues to hold a committed place in their lives.